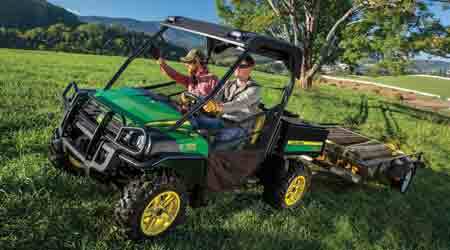 John Deere is offering a new special edition Gator utility vehicle geared towards customers who work long days and nights, and require additional storage to keep their tools organized and easily accessible. The XUV 825i Special Edition Gator vaunts two integrated cargo toolboxes ideal for carrying tools or supplies, plus LED roof lights for added visibility. The two cargo boxes are situated on the driver and passenger side of the 50 horsepower, 812 cc XUV 825i Special Edition vehicle. The driver’s side box opens from the top and has two divided compartments with a removable tray. The passenger side box opens from the side and features one open compartment. Both toolboxes boast 75-pound capacity. The special edition Gator also features two integrated LED roof lights designed for customers who are out early in the morning or late at night. The new LED lights use one-quarter the amps of equivalent halogen work lights and last 250 times longer. In addition to the special edition package, the heavy-duty model is outfitted with power steering, a deluxe cargo box with polyurea liner, integrated brake and tail lights, and an Operator Protective Structure (OPS) with nets. The vehicle is also equipped with yellow alloy rims and Maxxis Bighorn tires. A power and front protection package includes power lift, a heavy-duty front brush guard and fender guard, along with floor mats. Inside the cab the XUV 825i is outfitted with a yellow bench seat.